Keeping game players engaged is the goal of every entertainment asset owner, making the availability of two game boards in one machine a key draw for the Dual Game Cherry Master Switcher System – Standard Upright machine from 8 Line Supply. 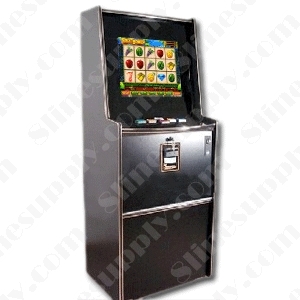 The Dual Game Cherry Master Switcher System – Standard Upright (Standard Trimline) machine features a 19-inch LCD screen. Players can easily switch between the two installed game boards with the touch of a button, or a wireless operator-only game selector can be installed. The machine stands 60 inches in height, 24.5 inches wide and a compact 18.25 inches deep. Two of the more popular game choices for the Dual Game Cherry Master Switcher System are Day of the Dead and 3 Musketeers, both by IGS. Day of the Dead is a popular 25-line game that is based on a holiday celebrated in many Latin American cultures. The game's Shuffle feature appears randomly, with various symbol combinations generating larger prizes. The Catrina feature initiates when the Catrina symbol appears. The Catrina symbols and other selected symbols will re-spin and provide a chance to turn into Wild symbols. 3 Musketeers is a 20-line game with XGA high-resolution graphics that features the Money Sack feature and the Duel Game features. Money Sack symbols appear randomly during play, with players earning extra credits or a credit multiplier on winning lines with a Money Sack symbol. The appearance of D'Artagnan and any other musketeer symbol triggers the Duel Game. The Golden Tee 2019 Online Home Edition has arrived, and 8 Line Supply is providing value in the form of a free software update for those who purchased the Golden Tee 2018 Online Home Edition from us after August 1. Contact 8 Line Supply for inventory updates and the availability of popular game boards such as Dual Game Cherry Master Switcher System and Gold Illusion 1 from Trestle. View original article on Dual Game Cherry Master Switcher System here.